FROM PALESTINE TO PEÑASCO – THE GAZA MONO-LOGUES: AN ADAPTATION IN 5 VOICES TELLS STORIES OF PALESTINIAN YOUTH LIVING UNDER OCCUPATION. On December 27th, 2009, Israel launched a military campaign against Hamas, the Palestinian group that controls the Gaza Strip. By the time there was a ceasefire agreement (January 18th), there were 1,440 dead and 5,380 injured Palestinians. On the Israeli side, four dead and 340 injured. The three week event became known as the Gaza Massacre. One reaction to the short war was led by Ashtar Theatre, based in Ramallah. A few days after the cease fire, thirty-one Palestinian teenagers started an internship at Ashtar Theatre as part of a drama-therapy program. Their writings were molded into The Gaza Mono-logues and on October 17, 2010, The Gaza Mono-logues were performed in 40 cities across 30 countries. The performance includes dance, acrobatics, and dramaturgy. After a couple years of collaboration, we have The Gaza Mono-logues: An Adaptation in 5 Voices in performance in Peñasco. I think that last bit is important. That this an “intergenerational cast of indigenous artists and artists of color” is something to be excited about. Us theatre goers would do well to consider the seeds and sources of our entertainment. William Sandoval (13), is a musician and actor from Española; Malaya Peixinho (15) and Hope Orange (15), are art students at New Mexico School For The Arts; Serena Rascon is a dancer, aerialist, choreographer, arts educator who grew up in Velarde and Española. She choreographed various movement pieces and consulted on the production. Kayo Muller, who also helped develop the piece, is a circus arts performer and arts educator, originally from Brazil, who calls New Mexico home. 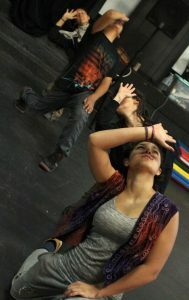 Samia Assed and her daughter Iktemal Jaber are Palestinian-American artists, activist-performers living in Albuquerque. They did the voiceovers for parts of the “mono-logues” in Arabic. Luis Guerra composed the music. 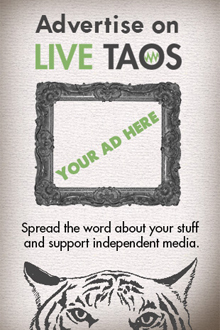 He’s a musician and composer who used to live in Albuquerque, but now lives in Los Angeles. 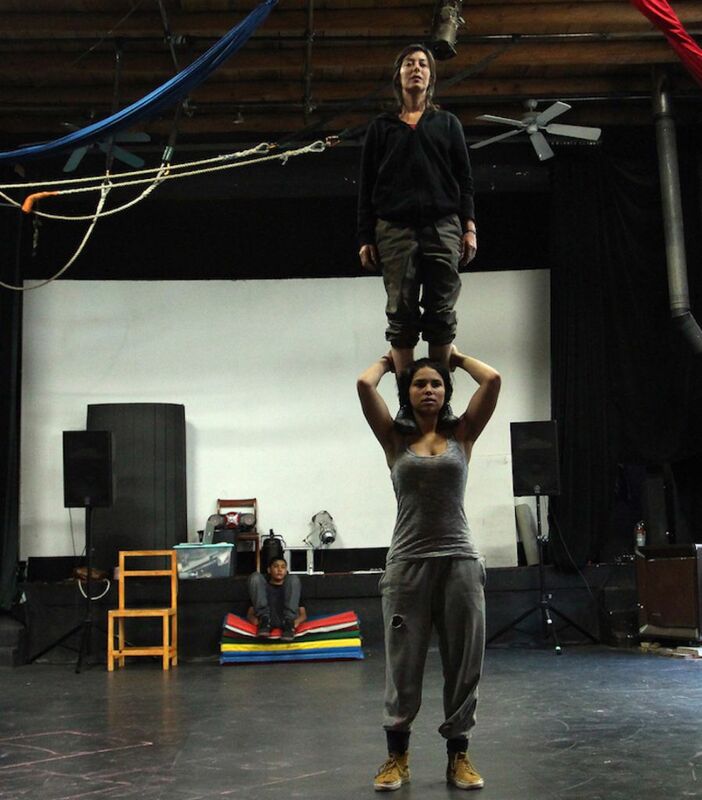 Kayo Muller stands on Malaya Peixinho’s shoulders during rehearsal at the Peñasco Theatre. Since the ceasefire agreement in Gaza in 2010, sporadic fighting has continued. Major incidents came to national attention in 2012 and 2014. This is one of those areas in the world where conflict is easy, peace is hard. We’ve all seen the news over the years. What Tarin and her collaborators have created lets us drop below the buzzwords and hear perspectives from the heart of human realities. The Gaza Mono-logues: An Adaptation in 5 Voices is presented by the Peñasco Theatre Collective this weekend at the Peñasco Theatre. Showtimes are Saturday October 8th at 7 p.m. with a matinee on Sunday October 9th at 2 p.m. Adult tickets are based on a sliding scale from $20 to $10. Youth tickets are $5 and children under 12 are free. For tickets and more information please visit PCT’s website. 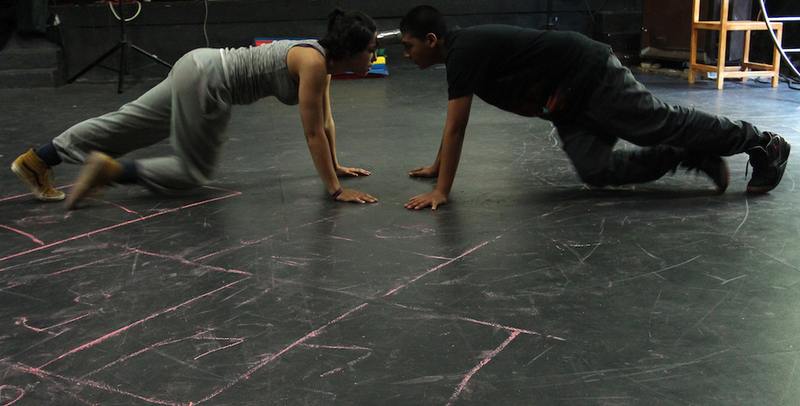 Malaya Peixinho and William Sandoval rehearse a scene that begins with kicking a can back and forth.